Even women who are fit and in shape suffer from the seemingly hard-to-fix problem of stretch marks. While it is a common belief that only pregnant or overweight women suffer from this problem, in fact, more than 90% of women are affected by stretch marks. Stretch marks are caused by factors that negatively affect the skin’s structure. After four years of extensive research, development and testing. Dr. H. Bellin Swiss Skin Care has discovered the secret ingredient to solving the problem of stretch marks: Swiss Edelweiss. Swiss Skin Care was developed by renowned plastic surgeon Dr. Howard Bellin along with a team of scientists directed by a world-famous cosmetic bio-chemist. Dr. H. Bellin Swiss Skin Care’s patented Scar & Stretch Mark Body Cream dramatically reduces the appearance of stretch marks and scars. Dr. H. Bellin Scar & Stretch Mark Body Cream contains Swiss Edelweiss (a widely known, but rare flower grown only above 6,000 feet in the Swiss Alps) to stimulate cell regeneration in combination with a blend of powerful polypeptides and other key ingredients to improve the appearance of broken skin and scars. It also uses a time release mechanism to keep the skin hydrated 24-hours a day. In addition to the polypeptides, this unique cosmeceutical consists of other highly concentrated and extremely effective natural ingredients, including blends of Vitamin B, natural butters and moisture-binding spheres of hyaluronic acid. The efficacy of each ingredient is documented and backed by clinical trials. 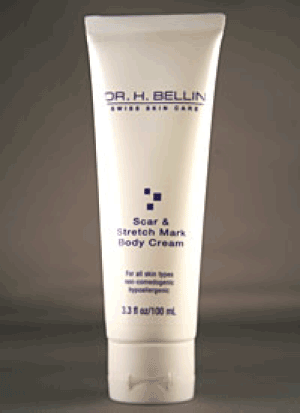 Dr. H. Bellin Scar & Stretch Mark Body Cream uses a two-fold process to help transform the skin: first, the skin is replenished with a filling effect that dramatically minimizes the look of stretch marks and scars; then, highly protective ceramides and firming agents aid in the delicate rejuvenation of skin’s texture, providing a softer, more supple finish. Disclosure: No compensation was received to post this giveaway. The information posted was taken directly from the product's press release.